Nestled on a hillside above the scenic village of S. Woodstock, Apple Hill is a cozy year-round home with a large deck offering views of the Kedron Valley. The setting features fields and woods, with nearby farms. Take a 10 minute walk down the hill to S. Woodstock, and you'll find- a country store( with penny candy, and deli serving delicious take-out food); Kedron Valley Inn with fine dining and a wonderful beach/pond for swimming; historic church and academy. An open floor plan on the first floor, allows for a relaxing atmosphere-living room with fireplace, dining room seats 8, den/TV room, generously supplied kitchen, mud room/entryway, powder room, bedroom (queen bed) and full bath. The second floor sleeps 5-6, in three bedrooms -one full, two queen-full bath on second floor. House includes washer/dryer. The house is equipped with a clothes washer and dryer. Such a sweet house. We really had a great time!! We had a wonderful stay at Apple Hill. The house is beautiful and so comfortable. Everything was as clean and as tidy as could be. We loved being surrounded by the library of books and spent a rainy winter day in front of the fire, reading and playing games. The kitchen is well appointed, bedrooms are very comfortable. We also had good contact with Mary, the owner, and Stacy, the caretaker, although everything was perfect and we did not need any help at all. We feel so lucky to have found Apple Hill and hope to return again! Thank you! Beautiful, clean, comfy house for the weekend with my college kids. LOVED, LOVEd!! We are so happy it was a perfect place for you and hope you return. Great beautiful property close to it all and far enough away. Loved the big hill next to the house for sledding, warm fire place with plenty of wood, hundreds of old books, great kitchen for home cooked meals (also great pizza at bridgewater pizza place down the road). Close enough to Killington and Okemo. Place was actually bigger than expected with 4 Bedrooms and an upstairs loft. So happy you and your family enjoyed Apple Hill! We just returned from our fabulous trip to Vermont and this lovely home was the perfect choice for our getaway! 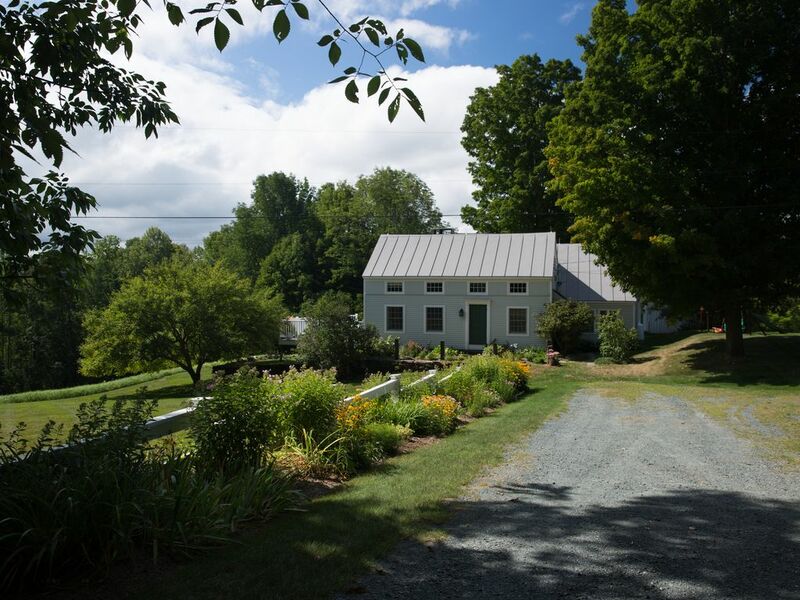 Not only is Mary a fantastic communicator, she cares deeply about her guests experience and has made this lovely home into the quintessential Vermont charmer. It is clean, well appointed and the setting is ideal! We loved it and are looking forward to a repeat trip next fall! We really appreciate your thoughts and comments. You were also great communicators and we would love to have you return. The pictures online do not do this property justice. When arriving at the home we were all pleasantly surprised by how spectacular the property was. The land was beautiful and private. The home was clean and well kept. The house is right down the street from the South Woodstock Country Store, one of my favorite places. I would highly recommend this property to anybody wanting to stay in the area. Thanks so much for your glowing review. Yes, the South Woodstock Store is one of our favorite places as well. We would love to have you return. Apple Hill is located 5 miles from Woodstock Vermont, in the small village of South Woodstock. Boston, Massachusetts is 3 hours away. We are a 25 minute drive from the junction of routes I-89 and I-91. Hanover New Hampshire is 35 minutes. The rates quoted are minimum rates and may be more or less depending on number of guests, season, and holidays (Christmas, Thanksgiving, President's Week, etc.) There is a 10% sales tax on fees( unless rental is more than 30 days), and also a cleaning fee. Cleaning fees may change, and will depend on number of guests and number of occupancy days. An additional $250 rental fee may apply to holidays. Please contact owner for definite rate information.